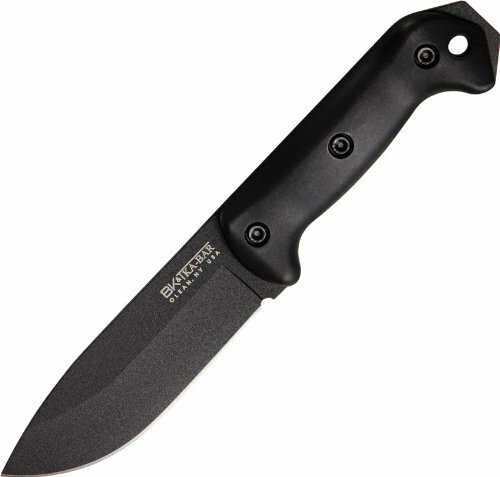 If you are in the market looking for a great hunting knife, you might want to take a look at the CUTCO KA-BAR BK-22. It is a second generation fixed blade from Cutco. The knife has received very positive reviews from those who have owned it, and I am pretty sure you will be impressed with it as well. The KA-BAR brand is well known and its reputation dates back to the early 20th century. The story says there was a man who was attacked by a bear. Unfortunately, his gun jammed and his only hope was a knife. He used the knife to slay the wounded bear. In appreciation to the makers of the knife, he wrote a message thanking them for making the knife. Sadly, the only readable was “k a bar”. This was then adopted and it is what has given rise to this popular brand today. Anyway, back to the KA-BAR BK-22. The whole knife gives an impression that it can go through anything you throw at it. Starting with the blade, it is sharp out of the box. Measuring just 5.25”,it is not too long and not too short, just an appropriate size. The knife is a little thick, this is good and bad at the same time. For instance, detailed work will be a nightmare, but the blade will stay straight when working on solid stuff. The drop point makes the knife perform excellently at tasks like skinning big wild game. Additionally, it retains edge well. Coming to the handle, it is big enough and it will fit well in an average hand without problems. The handle is made from Grivory, which is Swiss made glass reinforced nylon. The handle is great to hold. It feels comfortable and it makes controlling the knife easy. To make it even better, it has an extended pommel you can use to shatter glass, pound tent pegs or use it in any way you wish to. However, there is one little flaw. As you might already know, some hunting knives offer rugged handles which make them less slippery. The one on this knife is not rugged. So if the hands are wet, it can get a little slippery. Fortunately, the handle can easily be changed to another one of your liking. To talk about the sheath, it is made from heavy duty polyester. The whole of it feels solid and you can tell that it will last. However, it has one annoyance. There are 2 nylon retention straps on it that are somewhat a problem to snap. Others will find the knife a little heavy. This does not make it ideal for finer work or serious hunting. All in all, this is a great knife and it will handle many of your needs if you are into extreme sports. The build quality is excellent like you would expect from such a reputable company. The issue of the handle is not serious since you can have it replaced easily. And the fact that this knife is manufactured in America will definitely excite many. Your decision to buy the KA-BAR BK-22 will surely be one of the most rewarding decisions you will ever make as a hunter, the probability of disappointment is low. All in all, this is a great knife and it will handle many of your needs if you are into extreme sports. The build quality is excellent like you would expect from such a reputable company.